RealNetworks—yes, that RealNetworks—thinks it’s come up with a better way to help you store, move, and share your personal videos. Dubbed RealPlayer Cloud, the new service launches Tuesday in the U.S. and Canada with free and paid options, and broad support for video formats and devices. I played around with RealPlayer Cloud ahead of its official launch, and while it’s not necessarily a revolutionary service, I can say it worked both easily and well. You start by uploading videos, either from your computer via a Web browser or using an iOS or Android app. After that, those videos are available for you to stream or (in many cases) download. You can also choose to share videos by sending an email link to someone, sharing via Facebook, or grabbing a link that you can post or share as you see fit. A recipient doesn’t need any special software to watch—videos play on iOS and Android devices, Windows PCs and Macs, and Roku hardware (as well as the Apple TV via AirPlay). 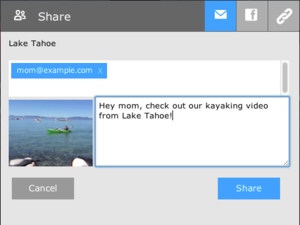 And recipients can also download shared files, as can you for offline viewing. You can generally share videos that are as long as 15 minutes each—a restriction basically meant to prevent you from sharing TV show and movies—but there’s no time limit for videos shot on a mobile device. Real says it foresees, “introducing technological advances that will allow RealPlayer to recognize the origin of the video (a smartphone versus a Hollywood production) and adjust the sharing function accordingly” but that’s not the case right now. To test it out, I uploaded several MP4 videos, as well as one that I shot on a Moto X smartphone using the RealPlayer Cloud Android app. All of them were available to watch quickly and played well on multiple devices. RealPlayer Cloud accepts a variety of video formats and containers, including FLV (Flash), WMV (Windows Media), MKV (Matroska), DivX, Xvid, Mov, AVI, and MP4. The system stores multiple copies of the source file to account for device type, screen size, bandwidth, and device storage. Devices on the same network talk to each other over Wi-Fi. When you sign up for a free account, you get 2GB of source file storage, which Real says equates to 3 to 4 hours of SD video, or about 1 hour of HD video. Real offers three paid tiers as well: Silver is $5 a month or $49 a year, and provides 25GB of storage; Gold costs $10 a month or $100 a year for 100GB; and Pro runs $30 a month or $300 a year for 300GB of storage. All paid plans give you access to the company’s $50, Windows-only RealPlayer Plus while your subscription is active, and adds the abilities to burn HD videos, clean up your music library, and more. 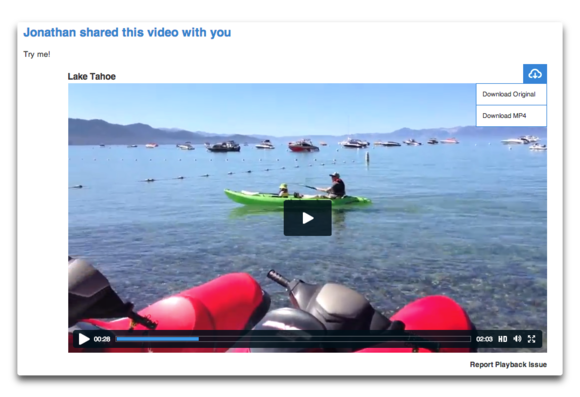 The Web interface is clean and fairly intuitive, and you can group videos into collections, adjust view options in many different ways, and easily see which videos you’ve shared with others or are shared with you. In the cloud with Android. 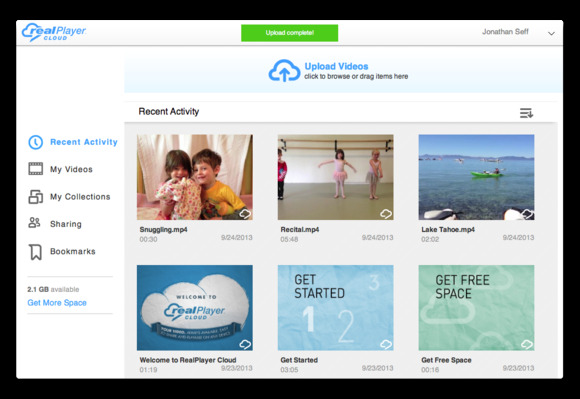 RealPlayer Cloud is by no means the only way to share video with others or make sure you have access to your stuff wherever you go. A free Vimeo account gets you 500MB of uploads every week (only one in HD, though), while $60 a year ups the limit to 5GB a week, as much 1080p as you want, and really good privacy controls. YouTube is free, and lets you upload huge videos, but isn’t the best with security settings and playback quality. iCloud supports videos up to five minutes long and maxes out at 720p resolution, and is more limited in where and how you can share. For casual video sharers and people who want access to some of their videos in different places and on different devices, RealPlayer Cloud isn’t a bad way to go. 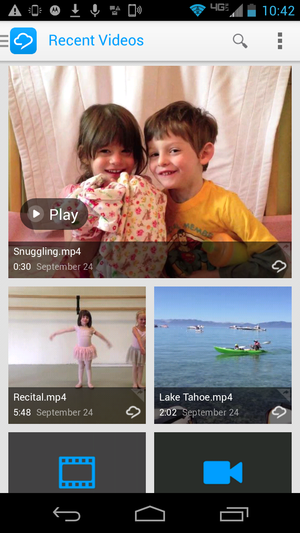 It’s easy to use and offers a secure way to share videos with just those you want. If you need to store or share everything you shoot, or like to embed your videos on blogs, you should probably look elsewhere. 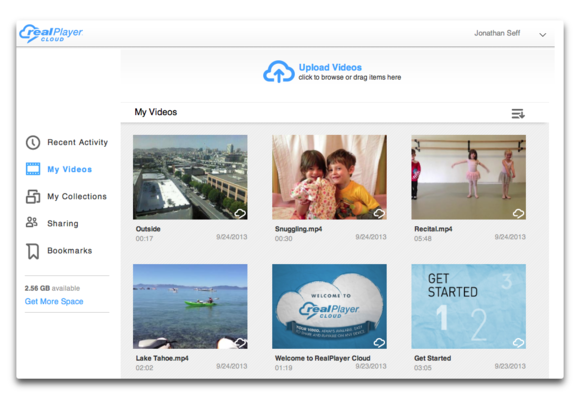 But for many people, the free RealPlayer Cloud option is worth a try.